Local lad Paul came through the youth system at Watford and made his debut in a local derby with Luton Town. He went on to win two promotions with the club, and made more than two hundred appearances before being controversially sold to West Bromwich Albion in 2003. 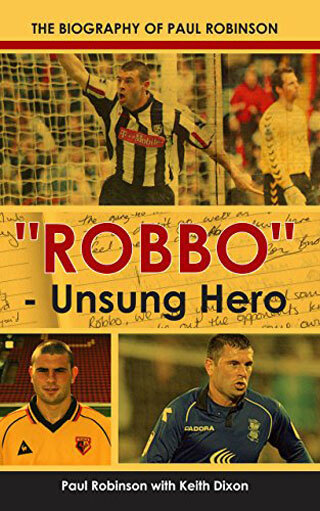 Still playing in the Midlands for Birmingham City, he released his autobiography “Robbo – Unsung Hero” in 2015. Watford Legends spoke to Robbo in 2008 while he was still with West Bromwich Albion. Hi Robbo! You came through the youth ranks and made your debut against Luton Town, how did you find that? Interesting! It made me the person and the player that I am now, a bit fiery. I can remember it clearly; it was only two minutes in. Dominic Ludden pulled his hamstring pretty much straight away but tried to play on. When he started limping people were telling me to go and warm up. I was nervous enough anyway but then two of my team mates from the youth team were on the bench with me and looked even more nervous for me! I knew there was a chance I would go on when I went to warm up, then I heard the manager calling me back over and he told me to get stripped quickly. My heart was thumping a bit! To be fair though it was excitement as much as nerves. I knew I was going on so I just wanted to get on quickly and deal with anything that came my way. How much of the game do you remember? I remember bits and pieces of it. It was a strong, fiery game as derby games always are. Those are the games you really cherish and enjoy but the fact it was my debut made it extra special. We drew that game 1-1, with Darren Bazeley getting a really late equalizer. How did you find the games with Luton Town overall? I loved them. Really loved every minute of them they are even better when you win of course so you can rub it in a bit! Ah the 4-0 game, that was a great game. I was sat on the bench that day and I was more scared sitting there than if I had been on the pitch! The fans were going mad, punching the dugouts and trying to get on the pitch but the police were doing nothing, they were getting bullied themselves so we just sat there and expected the worst to happen. But it was a great day and a great result. I remember Peter Kennedy got two that game and he was winding their fans up with his celebrations which meant they were getting more aggressive! We were shouting at Pete to just head back to the halfway line and not towards the dugout! I absolutely loved those games, especially that one because of the way that we played and the result that we got made everyone so happy especially the fans. Were you a Watford fan as a boy? I was a Tottenham fan as a boy, but the first result I look for after a game now is Watford. I still keep in touch with the likes of Tommy Smith as well to see how he is doing. Are there any particular games that stand out for you from your time at Watford? The cup semi final against Southampton was a huge game for us to be playing in, and also at the time it was a big financial windfall for the club that was much needed. 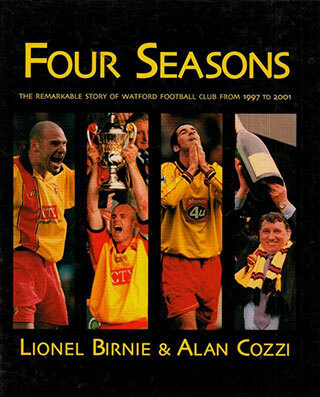 But to be fair, I enjoyed every moment of my time at Watford. To be a local lad that came through the ranks and play first team football for my local club was brilliant. I loved every bit of it and really enjoyed my football. There has been some talk over the last couple of years about you returning to the Vic, how much substance was there to that? There was quite a lot of interest. I spoke to Aidy a couple of times and I have to say he is a gentleman, such a nice fella. He called me to get my views on it and see how I felt about it but for whatever reason it didn’t happen. The clubs would have needed to agree a fee first of all; the personal terms have to be agreed. One bit I didn’t feel comfortable with was that Watford had sold me for such little money so for them to buy me back but has to pay a lot more; I didn’t feel it was right. Hopefully I will get the chance to come back one day though; we will have to see what the future holds. Is it fair to say that in an ideal world then you would like to come back to Watford at some stage? I never plan too far ahead! I like to take each day as it comes and enjoy each day, but also all my family and friends are down there so it would be nice to go back again one day in some capacity but I will just have to wait and se if that day does come and wait and see whether it is as a player, coach, manager or anything really. It would be nice to do. Is management something that you would like to do when it the time comes to hang up your boots? Definitely. I have started doing my badges as it is definitely something I want to do. I want to help people the way that I have been helped through my career and hopefully get people to do bigger and greater things if they can. It would be nice to see more homegrown youngsters come through at there clubs and have a good career in the game. How did you enjoy your time at Watford under Vialli? I enjoyed it, the type of football he encouraged us to play was great. It’s always good to learn different things of different managers and I really enjoyed my football. Unfortunately the money side of things didn’t work out for the club. Some of the players that came in just didn’t perform as was hoped, and players just didn’t click with each other which was really disappointing. Obviously the club suffered long term with the money problems. All in all it was a massive gamble and it backfired. Do you have any beef with any of the players that were there at the time for maybe turning up just to pick up the money? For me you have to have a respect for your team mates, maybe there was a lack of that but it wasn’t for me to say that. That was down to the manager to do, and he has to see that and put his foot down. I feel that he did but those players stayed around and caused trouble for some of the others, I think that was the biggest problem. Too many bad eggs causing trouble for all the others. The manager brought these people in expecting them to do a job but some of them just didn’t do it. Ultimately that cost Luca his job, cost players money and more importantly it stopped the club from progressing. Who would you say is the best manager you have played for so far in your career? That’s a tough question. I really enjoyed my time under Graham Taylor, who better is there to learn from than someone who has managed England? His knowledge and experience in the game is fantastic. He also gave me my opportunity to play football and I owe him a massive amount for that, as well as Kenny Jackett. At the moment though Tony Mowbray stands up there by a mile. His football knowledge is unbelievable, and the way he gets us to play football is just second to none and we proved that last year by the way we played and we have started this year really well. It’s really enjoyable working for him. You made comparisons recently between Vialli and Mowbray, is that because of the style of football they liked? Yes, they both like to play great football. The knowledge behind it and the tactical awareness is just amazing. The training is very technical, it’s all about passing, possession, little five-a-sides, attacking, defending. Very in depth but without pressure, he wants us to go out and enjoy our football. Jonno has been superb for us, and he always wants the ball even in ridiculous positions. You need those people in your team though. He is a good mate of mine and has been my room mate for five years now. He did celebrate the wrong way though and I did have a little word with him after the game…I told him he was going to get me grief from my family and friends for winding the Watford fans up! How did you find your reaction from the fans when you came back last season? It was fantastic. I didn’t get a chance to say goodbye as the move was done in quite a short space of time when I left. that was a shame, as I would have liked to have said thanks to everyone, not least the fans who were absolutely brilliant to me when I was up and coming and then playing in the first team so it was a great chance for me to send my regards to everyone and thank everyone for their support. The welcome I got was unbelievable and definitely a moment to treasure and I will always remember it. I had goose bumps and the hairs were standing up on the back of my neck. People were clapping and shouting Robbo. I didn’t expect it. I always thought I would get a nice reception, but what I got was unbelievable and I was overwhelmed. What do you make of the current Watford side? I think Aidy has done a fantastic job there. The bits you read about the chairman in the paper can be very unsettling which can be frustrating. I still speak to Smithy and although he doesn’t talk about it you can see he is frustrated, but I still think they have a great chance. The manager is great and can push the players forward. Some of the players still need to gel together and start getting results week in week out and start picking up points. A lot of talk about Tommy Smith moving on in January, do you know anything we don’t?! I don’t know anything about him going. There will always be speculation because Smudger is a quality player and he has done well there. I spoke to him before he went back to Watford, and he was worried how people would react to him going back. I had no doubt he would go back there and do a fantastic job and he has done exactly that. He is back settled in now, the fans have been good to him and he is enjoying his football. So in answer to your question, I don’t know! You will have to phone Aidy and ask him! Was there much banter between you two in the build up to the game last season? Yes, but friendly banter. That day was just a day when we clicked and everything just turned to gold. Everything went for us. We set out to not let Watford get in their stride and not let them bully us, and Tommy just had one of those off days because we played so well on the day. How big is the difference as a full back from playing Championship football and Premiership football? It can be a big difference if you are trying to mark Ronaldo! I just go into every game with the intention of playing as well as I can but at this level you are playing against world class players who are fully fledged internationals. They are fitter and stronger but you have to enjoy these moments. It is a new challenge for me but one I am enjoying. Even from the last time I was in the Premiership with West Brom and before that with Watford, the difference from then to now is huge. The players are just so good. In the Championship you get more physical wingers who will try and bully you more and rough you up. With people knowing what I am like, they try and wind me up to try and get a reaction and try and get me to throw a punch at someone, where as in this league the wingers will try and run at you and see what you are like as a defender. It must be tempting sometimes if you get a tricky Ronaldo like winger, to just kick them up in the air?! That’s if I could get near him! It’s not in my mind to think like that. If there is a tackle there to be won then I will go in for it. If I catch people afterwards then I will pick them up and apologise. Watching Ronaldo last year I wouldn’t have wanted to mark him, he was unstoppable. How are you feeling with how your season is going so far? It’s going well and there is a nice buzz around the place. But we are not getting too confident as you can quickly go on a down fall. We have done well so far but we need to keep working hard and take it game by game. Is Wembley your biggest high in football so far? Definitely. To play in a cup semi-final at Wembley in front of 90,000 people is amazing, a dream come true. People still ask me about the old Wembley from when I won there in the play-offs with Watford and to be honest I preferred that mainly because of the long walk out onto the pitch. I wish they had kept that walk and the twin towers. The tradition has been taken away, but it is a new stadium in a new era for English football and the stadium itself is superb. I am a lucky man though that I have had the opportunity to play at both Wembleys and that will always stick with me. You have had some great highs with both West Brom and Watford already, what are your ambitions as a player now? To keep going forward as a player. I am not getting any younger and I want to stay in this league for as long as possible and that is the standard I have set myself. I need to keep looking after my family also, so that keeps me going forward and trying to improve. This is the best league in the world so this is where I want to be. Are there any other Watford players you stay in contact with apart from Tommy Smith? Wardy I speak to every now and then and he is back at Watford now which is great, Richard Lee I speak to, Lloyd Doyley I keep in touch with. All the other lads from our era have moved on in different directions now. Do you think Doyley will ever score a goal?! Only if he throws it in! He is a great lad, but he will never score! It has been mentioned that if we were in a game and 3-0 up late on and we get a penalty they would get him to take it! I don’t think he would do it to be honest! I think he would rather never score rather than risk missing a penalty! Do you still have hopes of getting involved in the England squad? I am an ambitious person, and I would love to play for England and always would if I was given the opportunity. I will always be available for England until I stop playing. I will just keep trying my best and hope that that chance comes along. I play to high standards every week but it all comes down to one man giving me my chance and hopefully one day Mr Capello will give me that chance. We will just have to see and keep my fingers crossed. Well we hope that the chance comes for you. Thanks a lot Robbo.